A decent bookkeeping service, but overpriced for what you get. 1&1 Internet may be best known for its web hosting products, but the company has bigger ambitions than that. 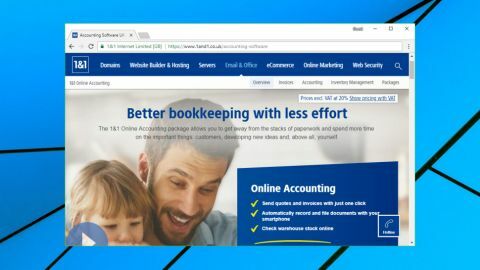 The latest addition to the range is 1&1 Online Accounting, a cloud-based set of bookkeeping packages aimed at freelancers, small and medium business users. The software is powered by sevDesk, a brand of the German developer SEVENIT. SevDesk has only been around since 2014, but the company has been working hard to internationalize it, and the 1&1 Online Accounting service is now fully adapted to the legal and business requirements of the UK. Online Accounting plans start with Invoice, a simple package for preparing quotes and invoices only. Standard templates make it easy to get started, and you can brand documents with your own letterhead and logo. It is licensed to a single user for access on any device, and can be yours for £4.99 ($6.69) a month over the first year, £9.99 ($13.38) on renewal. That's a little expensive; ClearBooks gives you more functionality in many areas (though no VAT on the starter product) and supports unlimited users for the same price on monthly billing, dropping to £8 ($10.70) a month if you pay for two years up-front. 1&1's Accounting plan adds online cashbook management, document filing, an overview of cost centers, DATEV export and separate access for tax advisors. Your account can be accessed and managed by up to three users, and it's priced at £9.99 ($13.38) a month for year one, £19.99 ($26.76) on renewal. Again, competitors like ClearBooks offer more features for less. The high-end Inventory Manager plan also includes warehouse and stock management features, including an up-to-date inventory overview, speedy options to write and dispatch delivery notes, and tools to check customer and supplier prices. The service can be accessed by up to ten users, and it's priced from £19.99 ($26.76) a month for year one, £39.99 ($53.53) on renewal. That's not cheap, but inventory management is a valuable feature which isn't always an option elsewhere. All plans are supported by a couple of mobile apps. SevDesk gives you access to the core service, and sevScan digitizes receipts for including in your records. Both apps are available for Android and iOS. No business can afford to have this kind of critical service go down for long, so it's good to see that 1&1 Online Accounting includes 24/7 support by email and telephone. There's another welcome safeguard in 1&1's money-back guarantee. You can try Online Accounting for up to 30 days, and if you're unhappy, you can cancel the product online (no need to fight your way through customer service) and receive a full refund of all your costs. The 1&1 website does a reasonable job of presenting the features of its Online Accounting plans, and most users will quickly be able to decide which product they need. Tap the Buy button and you're able to purchase the plan on a monthly or annual contract. There's no initial discount for monthly contracts, so they're not the most appealing of choices; for example, 1&1 Inventory Manager costs £39.99 ($53.53) if you choose the monthly option, £19.99 ($26.76) if you go for annual. Even better, annual contracts are billed monthly, so there's no chunky up-front bill. Hand over your cash by card or PayPal and you're prompted for your personal details: name, physical and email address, phone number, company name and type. A couple of emails arrived soon afterwards with confirmation and acknowledgement of our order, but nothing related to the Online Accounting product itself, no product summary or description, no 'getting started' details, no clear links to help resources. The Welcome email didn't even mention the word 'accounting', as we'd signed up for the Inventory Manager product, and if anything it seemed to suggest we had purchased web hosting (at the bottom of the email a line told us 'If for any reason you are not satisfied with your website you can cancel your package within the first 30 days from date of purchase to receive a full refund'). We read between the lines and followed the link to 1&1's Control Panel, where there was an icon for Online Accounting, and tapping that started the real login process. Although we had chosen to register the product for personal use, 1&1 Online Accounting started by demanding we enter our company name. It also asked for our country, preferred language and currency, as well as asking us for our phone number for a second time. By default 1&1 Online Accounting treats you as VAT-registered, but you can choose non-VAT registered status with a click. Login complete, the service finally takes you to your web dashboard where you're able to get started. 1&1 Online Accounting opens with a visually appealing overview of your accounts, including a summary chart of revenue and costs and a list of any to-do-type tasks you might have set up. A drop-down list enables carrying out common actions in a couple of clicks, including creating recurring invoices, proposals, order confirmations, delivery notes, contacts and tasks. Most of these areas use the same document creation tools, with boxes to enter customer information, invoice details, header content, footers and more. There's a lot to look at, but once you understand one of these actions you'll quickly be able to figure out the others. A left-hand sidebar gives you speedy access to service modules, including Contacts, Orders, Invoices, Receipts, Payments, Documents, Reports, Tasks and Inventory. You'll probably want to use this early on to create your list of contacts, or import existing details via CSV, and use the Inventory section to build up details of your products. While this might sound complicated, you only need to delve into the full modules when it's absolutely necessary. A Search box on the Dashboard enables finding contacts, orders, invoices and more by keyword, and a Last Viewed list means recently-accessed records are only ever a click or two away. The 1&1 Online Accounting Dashboard presents itself as a summary of your setup, but you can do a lot of work from the page, too. Choose Add Proposal from the drop-down list on the right, for instance, and a form enables entering your contact's details, product details, header and footer content and more. You won't have any stored contacts or products just yet, but that's okay - 1&1 Online Accounting allows you to create new ones from the Add Proposal and other document creation screens. Save the proposal and it's saved on the system. Revisit the document later and you're able to convert it into an order or an invoice, generate it as a packing list, maybe mark it as 'order denied' if you know it's not going to happen. 1&1 Online Accounting follows much the same principle with other documents; the service does its best to help streamline your workflow by allowing you to carry out relevant actions from any item with a couple of clicks. The service is a little underpowered in some areas. The Reports section offers only two report types, for instance, Income Statement and VAT, and neither are particularly configurable. Exporting is relatively easy, though, with for example the ability to download a PDF copy of your income statement with a click. Interesting productivity boosters include smart receipt scanning, where you can add a scanned receipt as an image or direct from the app, and a text recognition system attempts to automatically detect and add the date, amount, supplier and other fields to the system. A handy built-in task system enables creating reminders for calls, emails, appointments and other custom to-dos. It's no substitute for a standalone to-do manager, but the integration with the system makes it worth having. If you're confused by any of this, tapping a Help icon in the bottom right of the screen opens up a very basic text knowledgebase. This covers the essentials, but no more - advanced options are often ignored, and there's very little general advice or overviews on how to use different areas of the program. 1&1 does at least have its 24/7 support, a very valuable extra if you run into problems. Response times are fast, but diagnosing accounting issues requires a very different set of skills to 1&1's usual web hosting issues. If you take the 30-day trial, test the support team carefully before you sign up. 1&1 Online Accounting has a decent core set of features and is straightforward to use once you've mastered the basics, but the big-name competition often gives you more and charges less.